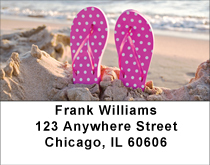 "Beach Flip Flops Personal Checks" product is already in your cart. Beach Personal Checks - Let your mind escape to that happy place in the sun, putting down your flip flops to go run into the waves! These personal checks will get you to that place of relaxation thinking of fun in the sun and sand in your toes.